AfterElton has a rundown today of the top 50 gay and bisexual male characters on TV, as voted for by the site’s readers (who are mostly gay men). I’ll let you go over there to read the list, but I had some observations I wanted to share. The main thing to notice is that the vast majority of these characters debuted in the last decade; 41 of them, in fact. Of those, 28 debuted in the last five years (with a further three debuting before 2005, but coming out after). Memories are short, of course, and recent characters are always likely to have an advantage in a popular vote. Controversial early groundbreakers like Mr Humphries and Steven Carrington clearly weren’t popular enough to make the cut, but there is good reason for them to be unpopular. There clearly aren’t a lot of missing characters from before 2000. When AfterElton did the same poll in 2007, they only offered a top 25 - there probably weren’t enough popular gay characters of note to fill a top 50. There are now, though they come from just 29 shows, of which 19 are still airing (though two of these are on their way out). It’s notable that sister site AfterEllen compiled its own list and had to allow characters from movies to get to a list of 50 gay and bisexual female characters. Some other breakdowns for your consideration. Only 14 of the characters come from US primetime network TV. Nineteen are from cable shows. There are four from daytime soaps (two couples). Thirteen characters are from outside the US; eight from the UK, four from Germany and one from Canada. Twelve characters come from soaps, and eleven from three queer dramas - six from Queer as Folk USA, one from the UK original, and four from the short-lived black gay drama Noah’s Arc. Of the remainder, three characters come from sci-fi, five from sitcoms, four from comedy dramas and five from teen dramas. Eight of the characters are black, and four of these are from one show aimed at a black gay audience. Two are Latino. Only one is South Asian and none are East Asian. None of the characters identify as bisexual. Captain Jack Harkness is ‘omnisexual’; four characters fell in love with men but didn’t otherwise identify as gay; two are still in denial (Ugly Betty’s Justin and EastEnders’ Syed). More than half the list is comprised of couples, albeit not always model couples. Only two of the couples come from US primetime shows - Brothers & Sisters and Modern Family, both of which are ensemble shows about extended families with gay members. All the other primetime gays are usually single. What can we learn from all this? This isn’t a survey of all the gay characters on TV, but it does represent the gay characters that gay audiences actually like, and there is the suggestion of a positive trend here. There appears to have been a rise in positive gay representation on TV in the last few years, thanks to shows like Ugly Betty, Modern Family, Glee and Brothers & Sisters on network, and shows like Caprica, True Blood, United States of Tara and Greek on cable. It’s also noteworthy that all the gay characters currently on air are supporting characters in ensemble shows. There hasn’t been a gay leading man on US primetime since Will Truman on Will & Grace, and he was famously sexless for years and years. Outside the US, the only leading man is Captain Jack. Of course, this is not the least bit surprising. That there was ever a Will Truman is the real surprise. In terms of diversity, more gays of colour would be nice, but when there are neither enough gay characters nor enough characters of colour on TV, that seems like a hopelessly optimistic wish. Bisexuality could clearly be a lot better represented - self-identified gays who dabble with women seem more common than self-identified bisexuals, and self-identified straight men who dabble with men are completely unheard of. 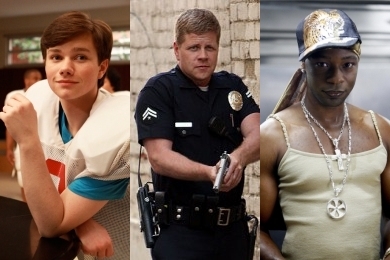 While we’re on a diversity tip, one might argue that fabulous bitchy comedy gays with an idiosyncratic fashion sense are a little overrepresented, but characters like Greek’s frat jock Calvin and Southland’s bearish cop John Cooper are finally providing some balance in that regard. The most interesting element of this list is that many of these characters have actually had storylines. To the best of my knowledge, only about a third of the characters have had ‘coming out’ storylines, which is nothing short of a miracle, and very few of them have been violently attacked by homophobes. Remarkably, some of these characters have been involved in love stories. Even more remarkably, some of these characters have been involved in stories that have nothing to do with their sexuality. Soap operas are both the best and worst in this regard; they frequently have coming out and gay-bashing stories, but they’re also more likely to do other things with their gay characters. We’re approaching level three here, people. Level one is when gay characters appear. Level two is when gay characters appear, do gay storylines, and then disappear. Level three is when gay characters appear, have love interests and do non-gay storylines, and don’t disappear. Level four is when we stop talking about how extraordinary it is.